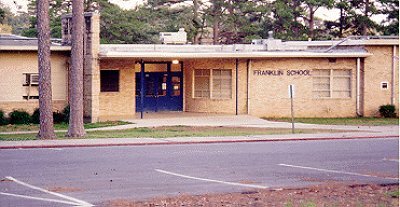 Franklin Elementary was built in 1949 and was named to honor Benjamin Franklin. The school is located on a 10-acre site in the Oak Forest neighborhood of Little Rock. The original building, equipped with the modern features of its time, featured 14 classrooms for students in grades 1 to 6. Franklin Elementary officially was dedicated on September 25, 1949, and its first principal was Miss Opal Middleton, a dedicated educator. Franklin opened as a state-of-the-art basic skills school, emphasizing a new and innovative way of teaching reading. Its two-level design gradually was extended to four levels with additions in 1954 and 1989. 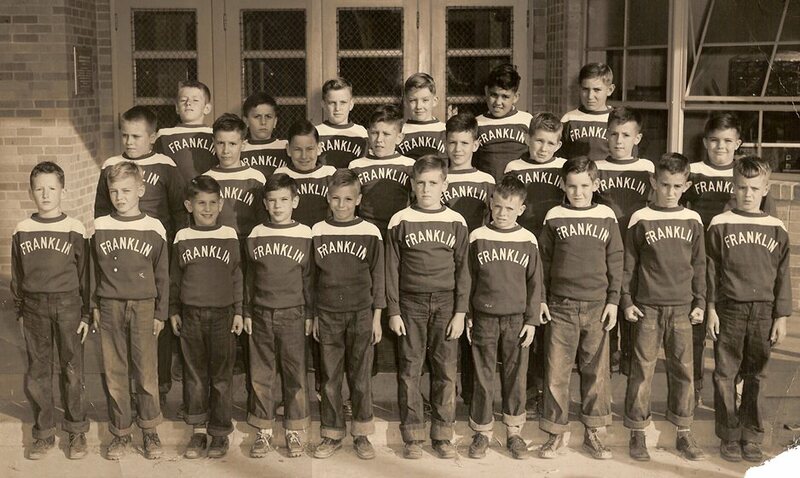 Franklin's football team, photo dated 11 Nov 1950. James Ward, Randy Pane. Photo courtesy of Ron Moore. When the LRSD changed its elementary school structure, Franklin was designated an intermediate school (grades 4-6); kindergarten students from the neighborhood also attended. This practice continued until 1987 when standard elementary schools (k-6) were reestablished. In 1989 one of the Little Rock School District's first pre-kindergarten (4-year-old) programs was established at Franklin. 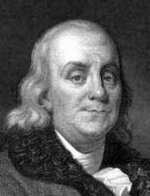 Benjamin Franklin was an American statesman, diplomat, author, inventor, scientist and philosopher. He was born in Boston, Massachusetts, and established the first circulating library in the United States. In 1743 he initiated plans for an academy that became the germ of the University of Pennsylvania. He established the Academy of Sciences in Philadelphia, served as Postmaster General of the United States, was a member of the Continental Congress, helped to draft and ultimately signed the Declaration of Independence and convinced the French government to ally with the Colonies in their fight for independence from England. Franklin also was a delegate to the Constitutional Convention. Benjamin Franklin was a genius as well as a practical man. Furthermore, his Autobiography and Poor Richard's Almanack became literary classics. Hobby, Selma; 1991 research project about the Little Rock School District.